welcome to "Semey" hotel complex! You have arrived to Semey for a business trip, conference, meeting or simply to see the friends and do not know where to stop? Welcome to “Semey” Hotel complex! Staying at “Semey” Hotel complex you can be sure that you will be given the comfortable modern rooms, great service and delicious meal. Besides, it is possible to organize a small celebration or business meeting, to visit sauna and to do sport. These serviceis not only for the visitors of city but for all Semey inhabitants as well. The hotel can serve about 100 guests. The places can be reserved in advance. Each room is an individual on design, style and color, it is created to give a comfortable residing and make you feel like at home. 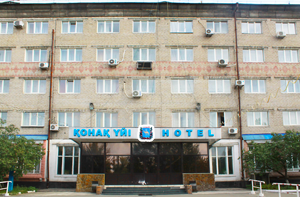 Today “Semey” Hotel complex has about 50 staff of the attendants and can serve about 100 visitors, arrange them at the comfortable rooms and give a wide spectrum of services, which is constantly extended. Basic guests of the hotel are the representatives of the mining enterprises of Kazakhstan and other countries of the world cooperating with the local companies of the given field. The pop stars of Kazakhstan and Russian stay at the hotel as well as the famous professors from foreign countries rendering the humanitarian help to the medical entities of Semey, and representatives of the public organizations. For example, Doi San and Omiya San had been living here for a long time, they gave the modern equipment for cancer treatment to the local oncologic dispensary. Also the travelers stopped at the hotel several times. “Semey” Hotel complex also served such Russian pop stars as Tatiana Ovsiyenko, Vlad Stashevski, Nickolai Rastorguyev, "Gosti iz budushego" band and "Otpetyue moshenniki" band, actors Irina Alpherova and Lev Durov, and also Kazakhstan stars such as Roza Rymbayeva, Roza Baglanova, Bibigul Tulegenova, Batyrkhan Shukenov, "Al-Davai" band, "Tamasha" comedy show, "Bauyrzhan show" and others.